Events from the year 1927 in the United States. January 7 – The first transatlantic telephone call is made from New York City to London. February 23 – The U.S. Federal Radio Commission (later renamed the Federal Communications Commission) begins to regulate the use of radio frequencies. In New York City, the Roxy Theater is opened by Samuel Roxy Rothafel. The first armoured car robbery is committed by the Flatheads Gang near Pittsburgh, Pennsylvania. May 20–21: Charles Lindbergh flies from New York to Paris. April 22 – May 5 – The Great Mississippi Flood of 1927 affects 700,000 people in the greatest national disaster in U.S. history at this time. May 2 – Buck v. Bell decided in the Supreme Court of the United States, permitting compulsory sterilization of people with intellectual disability. May 11 – The Academy of Motion Picture Arts and Sciences, the "Academy" in "Academy Awards," is founded. May 14 – The University of Chicago's local collegiate organization, Phi Sigma, becomes incorporated under the laws of the State of Illinois as Eta Sigma Phi, the National Honorary Classical Fraternity. May 17 – Army aviation pioneer Major Harold Geiger dies in the crash of his Airco DH.4 de Havilland plane, at Olmsted Field, Pennsylvania. May 18 – Bath School disaster: Bombings result in 45 deaths, mostly children, in Bath Township, Michigan. 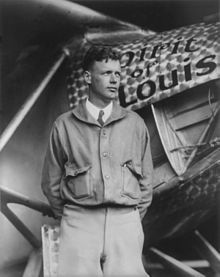 May 20–21 – Charles Lindbergh makes the first solo non-stop trans-Atlantic flight, from New York to Paris in the single-seat, single-engine monoplane Spirit of St. Louis. May 23 – Nearly 600 members of the American Institute of Electrical Engineers and the Institute of Radio Engineers view the first live demonstration of television at the Bell Telephone Building in New York. June 13 – A ticker-tape parade is held for aviator Charles Lindbergh down Fifth Avenue in New York City. August 2 – U.S. President Calvin Coolidge announces, "I do not choose to run for president in 1928." August 7 – The Peace Bridge opens between Fort Erie, Ontario, and Buffalo, New York. August 26 – Paul R. Redfern leaves Brunswick, Georgia, flying his Stinson Detroiter "Port of Brunswick" to attempt a solo non-stop flight to Rio de Janeiro, Brazil. He later crashes in the Venezuela jungle (the crash site is never located). September 18 – The Columbia Phonographic Broadcasting System (later known as CBS) is formed and goes on the air with 47 radio stations. September 29 – 79 are killed and 550 are injured in the East St. Louis Tornado, the 2nd costliest and at least 24th deadliest tornado in U.S. history. October 6: The Jazz Singer. October 6 – The Jazz Singer movie opens in the United States and becomes a huge success, marking the end of the silent film era. October 8 – Murderer's Row: The New York Yankees complete a 4-game sweep of the Pittsburgh Pirates in the World Series. October 28 – Pan American Airways' first flight takes off from Key West, bound for Havana. November 3–4 – Floods devastating Vermont incur the "worst natural disaster in the state's history". Frank Heath and his horse Gypsy Queen return to Washington, D.C., having completed a 2-year journey of 11,356 miles to all 48 states. The 7.3 Mw  Lompoc earthquake affected the central coast of California with a maximum Mercalli intensity of VIII (Severe), causing a tsunami and moderate damage. November 10 – Unexplained explosions occur in Canton, Ohio. November 13 – The Holland Tunnel opens to traffic as the first Hudson River vehicular tunnel linking New Jersey to New York City. November 14 – The Pittsburgh Gasometer Explosion: Three Equitable Gas storage tanks in the North Side of Pittsburgh, Pennsylvania, explode, killing 26 people and causing damage estimated between contemporary totals of $4 million and $5 million. December 2 – Following 19 years of Ford Model T production, the Ford Motor Company unveils the Ford Model A as its new automobile. December 15 – Marion Parker, 12, is kidnapped in Los Angeles. Her dismembered body is found on December 19, prompting the largest manhunt to date on the West Coast for her killer, William Edward Hickman, who is arrested on December 22 in Oregon. December 17 – The U.S. submarine S-4 is accidentally rammed and sunk by the United States Coast Guard destroyer John Paulding off Provincetown, Massachusetts, killing everyone aboard after several unsuccessful attempts to raise the sub. December 27 – Kern and Hammerstein's musical play Show Boat, based on Edna Ferber's novel, opens on Broadway and goes on to become the first great classic of the American musical theatre. The Voluntary Committee of Lawyers is founded in New York to bring about the repeal of Prohibition of alcohol in United States. This page was last edited on 16 March 2019, at 14:26 (UTC).